The quick-paced, historical Old Quarter is certainly a sight to see. Preserved colonial houses and shops line the busy streets. The narrow sidewalks are often used for motorcycle/scooter parking or a place to sit and eat/drink instead of a walking path. 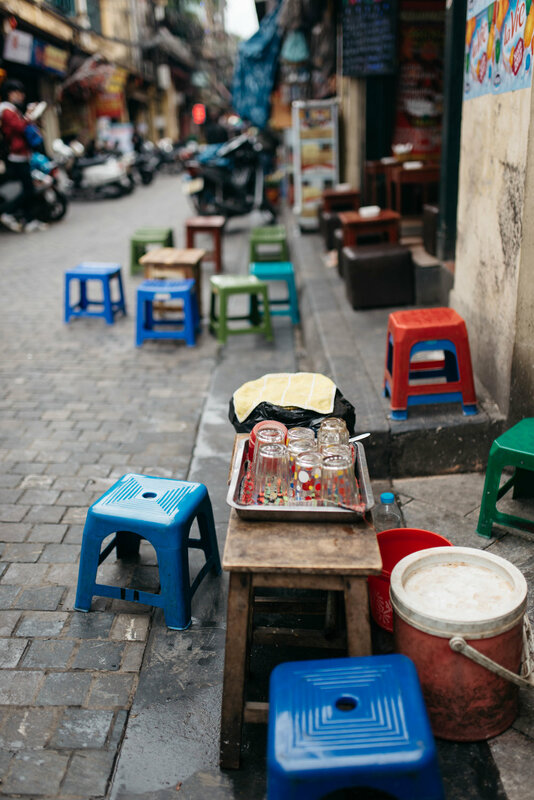 The streets in Old Town are commonly organized by different types of crafts/shops - you'll see soup and noodle streets, textile streets, silver/jewelry streets, even kitchen appliances and light bulb streets. 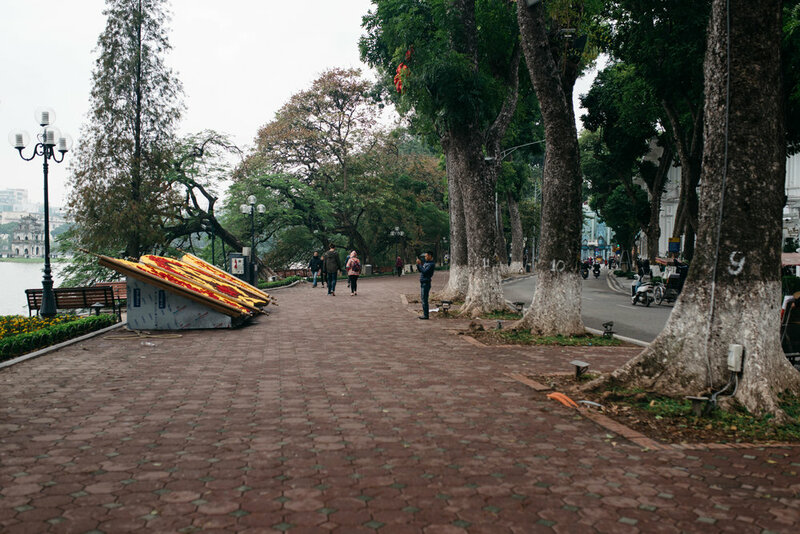 It makes it fairly easy to navigate this part of Vietnam as a tourist. Our favorite streets were the ones full of food! 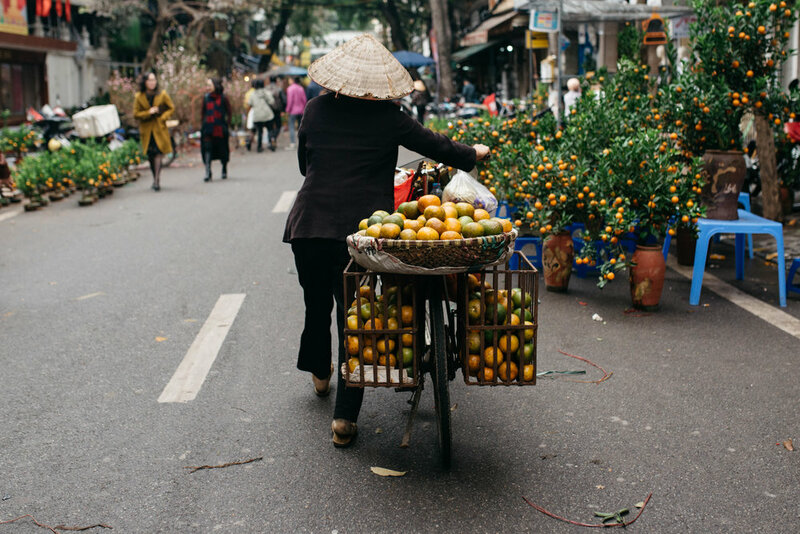 In Hanoi, there's a delicious Vietnamese cuisine along with many incredible French-inspired foods (of course including baguettes). DO visit Dong Xuan Market to see four stories of souvenirs, accessories, and clothing, along with a large variety of food being sold in the surrounding streets. For us, the lower levels of the market and surrounding streets were more exciting to see as there were many local people purchasing meat and produce. 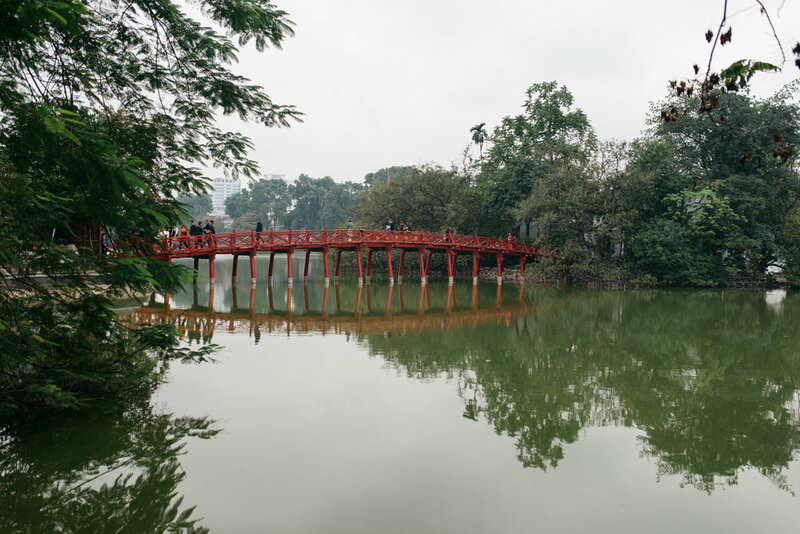 Take a morning stroll around Ho Hoan Kiem Lake. The entire walk will take less than 30 minutes at a brisk pace. If you go around 6 AM you'll be entertained by many locals exercising together. And if you walk around the lake in the evening you'll get to see beautiful reflections of the illuminated bridge. 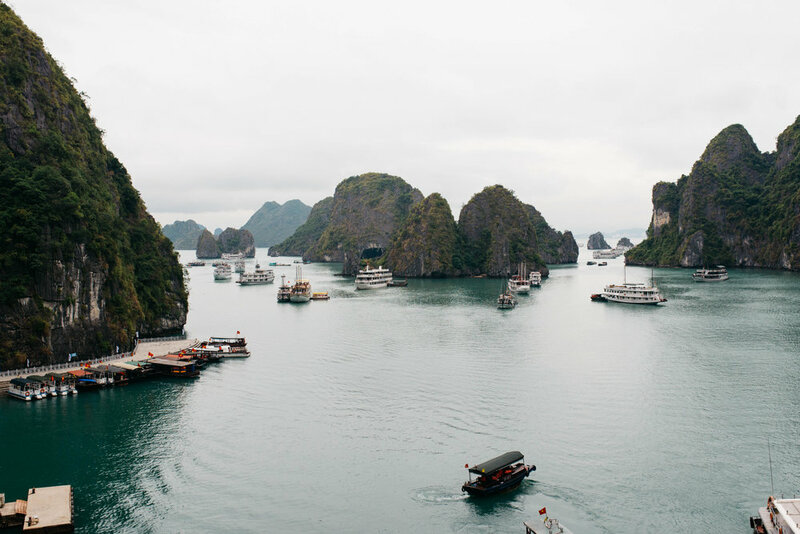 Spend time exploring Ha Long Bay. We reserved a one night, two day cruise that included transportation to and from Hanoi. For us, two days was enough to see the emerald waters and limestone islands. To get to Ha Long Bay from Hanoi it takes roughly 3 hours driving each way. Once you arrive at Ha Long Bay, your cruise will likely include kayaking/swimming, eating many large meals, a fun evening with drinks, gorgeous views from the sun deck, and walking through Surprise Cave. We recommend using a tourism company to book this as they can easily organize all of the details. It seems like it might be a lot more effort to arrange all excursions yourself from Halong City. Celebrate Tet New Year with locals if you are lucky enough to be in Vietnam for the holiday (end of January or early February depending on the year). The festive week leading up to the celebration will mean streets filled with red and yellow decorations. The "New Years Eve" celebration starts late in the evening with families gathering around the Hoan Kiem Lake and Bar Street packed with people. (Some years there are fireworks over the lake at midnight - unfortunately this year the government put a ban on them.) The morning after the festivities, the entire town shuts down. Almost all shops and restaurants are closed, and the streets are quiet and empty. It's a very unique way to see the usually busy town. If you do see some locals in the street, they'll likely be dressed in fancy new clothes as part of the Tet tradition. EAT at Banh Mi 25. This small street stand makes incredibly delicious sandwiches! It's recently become popular for tourists so expect to be surrounded by tourists! Also try pho at Gia Tuong, where you'll likely wait in a small line and end up sharing a table with local families. 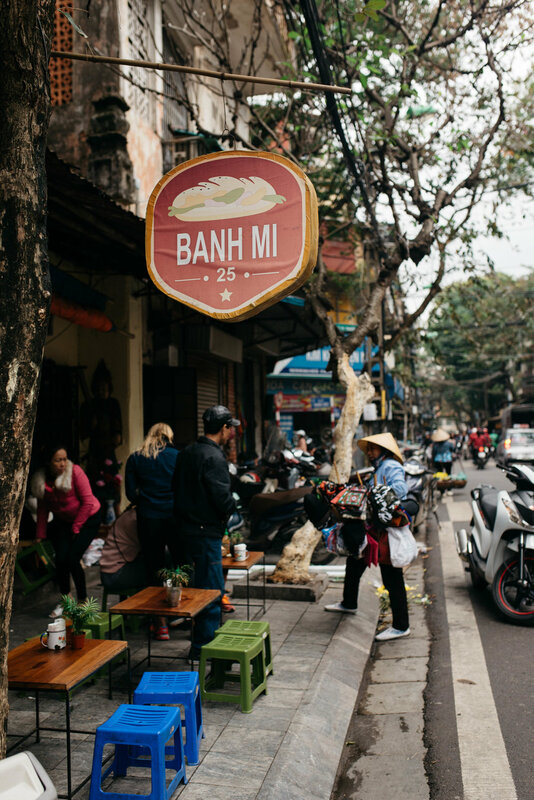 Other popular foods you'll want to try in Hanoi include bun cha (grilled pork served with some type of noodle), doner kebab sandwiches, and xoi ga (chicken steamed sticky rice). DRINK beer near Beer Corner (located at the intersection of Luong Ngoc Quyen and Ta Hien Streets). If you're willing to give it a try, Bia Hoi is a Vietnamese draft beer - also known as "the world's cheapest beer. It is said to be undrinkable after 24 hours of being brewed, and one glass costs approx. $0.22 USD. It can mostly be found in small bars and on the corners of Beer Street. 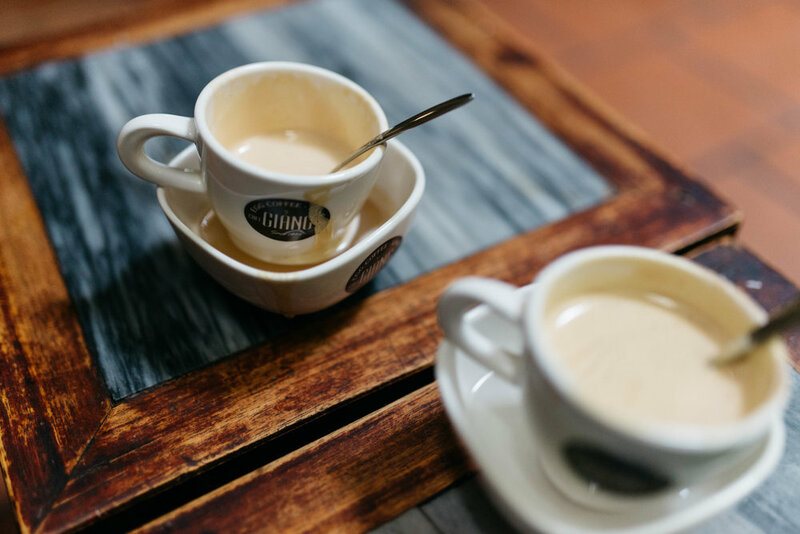 CAFFEINATE with the traditional egg coffee (called Cafe Trung). There are many cafes on Nguyen Huu Huan street offering this incredibly sweet, creamy treat. We enjoyed ours at Ca Phe Giang (Giang Coffee). 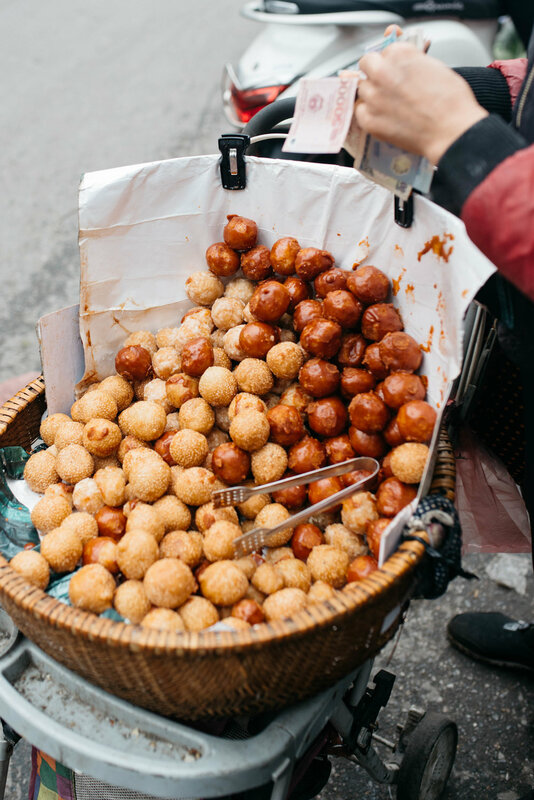 When finished, you can find Vietnamese donuts filled with mashed mung bean nearly anywhere on the streets. Beware: The ladies selling these treats will likely try to scam you. Discuss the price and how many you want before allowing them to start filling a bag full. If not, they'll try to ignore your question and then over charge you! STAY in Old Town for a lively, historical experience. We had a great experience at Hanoi Old Town Hotel. Although the rooms were slightly dated, the staff treated us like family and the location couldn't be beat. SHOP in all the little shops and markets throughout the Old Quarter. You'll find many shops selling non-authentic "North Face" or "Nike" gear. When visiting during the winter season (December to February) the weather can be quite cold, so you might be intrigued to negotiate for a few of these warm pieces. You can also find many of these items, along with some traditional Vietnamese items, at the Weekend Night Market. CRUISE by foot to take in all the sights of the busy town. This is perhaps one of the only cities we may not recommend riding scooters in unless you are really experienced. You'll spend most of your time dodging tourists and locals carrying food in the streets. 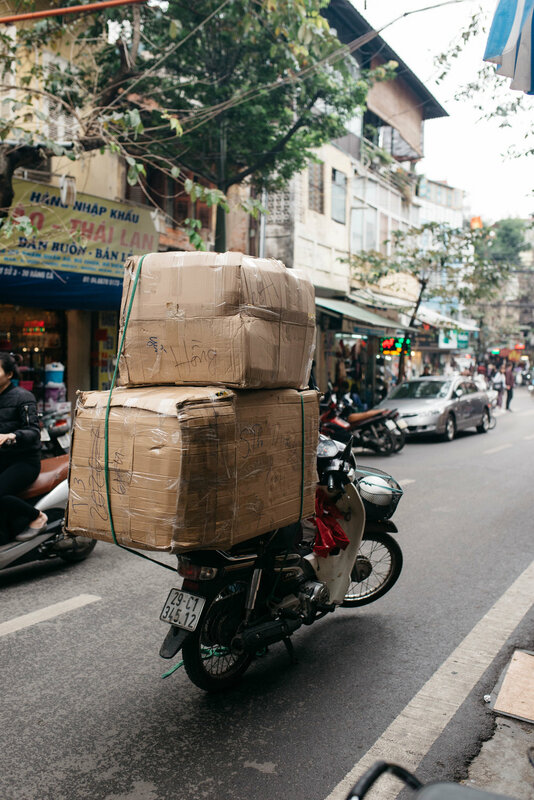 KNOW when walking around, it can be difficult to cross the streets due to all the scooter traffic. We found it easiest to find a small gap, walk quickly, and do not change your speed or stop! The scooters will (hopefully) maneuver around you.